In the previous issue, having returned to Atlantis, Aquaman seals himself away in his bed chambers to think on what he should do about the rising tensions between Atlantis and the surface while his advisers push to get through the door to see him. Eventually making it through, Murk informs his king that that the attack on the American submarine was made to look Atlantean. But the equipment was modified to allow the wearers to breathe under water, confirming that it was carried out by someone on the surface. Arthur goes to the leader of the Deluge, now his prisoner, to ask for the final time if he had anything to do with it, convincing the terrorist leader that war will simply result in massive death and destruction in Atlantis, and obtaining his help in solving the mystery. Back on the surface, Black Manta asserts his control of N.E.M.O. to it's other leaders, putting himself squarely at its head. Realizing that they need a diversion to not expose N.E.M.O. until they are ready, Black Manta authorizes the release of a monster to ravage Atlantis and keep Aquaman busy. This issue begins with Aquaman being informed of seismic activity in the area that appears to be footsteps. Going to investigate, Aquaman and a handful of soldiers encounter the muck covered monster, who swats Aquaman away as he tries to communicate with it. Seeing their king attacked, the soldiers open fire, Aquaman returning to attack as well, but each attack is easily brushed off and the creature keeps regenerating itself. Over with Mera, she is arriving at the Tower of the Widowhood in an effort to prove herself worthy as an outsider to marry into the royal family of Atlantis. Hearing the commotion outside, she attempts to go and help but is stopped by the Widows that insist that when the ritual is started it cannot be stopped until she learns the ways of Atlantis, and if she were to leave now, there would be no royal wedding. 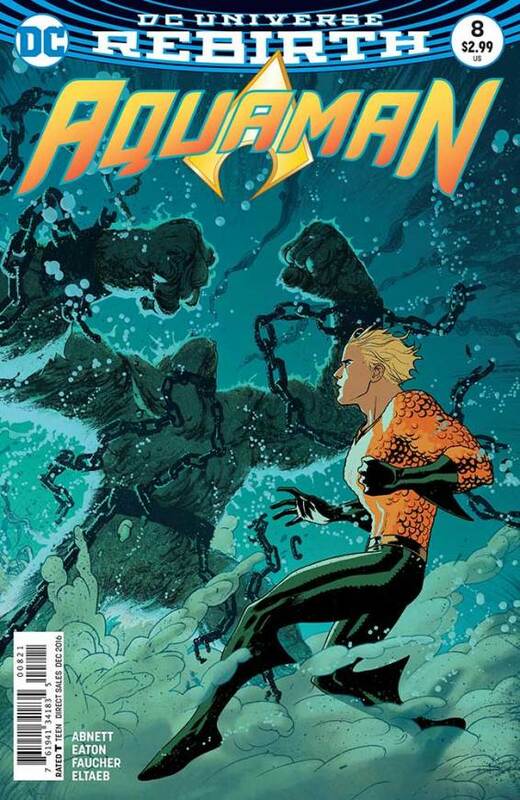 Back with Aquaman, he calls in a tactical strike from his army, who blast the creature, removing the muck and revealing it to be the Shaggy Man, a monster who adapts to attacks and becomes immune, and looking at his trajectory, they realize that he is simply passing through Atlantis to his final destination; Amnesty Bay. The artwork in this issue has not had any large changes from the previous issue, still being okay, but this issue is chocked full of odd faces, between the soldiers of Atlantis, the general population, and even Aquaman and Mera themselves. The monster itself looks pretty good, although with the regenerative powers working over the muck it looks more like the muck and seaweed are actually part of the monster as opposed to simply caked on as they end up being. I did really enjoy the design of the Widow's robes, being extremely long robes that go well below their legs, making it look like they are flying spectres and giving them an oddly ethereal feel. Ultimately I thought that this issue was good, but not great. We get a mixture of action with Aquaman and some more information about Atlantis, it's culture and it's politics with Mera, giving enough material regardless of what your draw to the series is. I'm interested in where the series is going with the monster, being one that I am unfamiliar with, but I'm not sure about the idea that we may be missing Mera for a little while in the future while she learns of Atlantis. Hopefully her sections will be more interesting than they are presenting in this issue, but I do look forward to seeing where this whole situation goes.